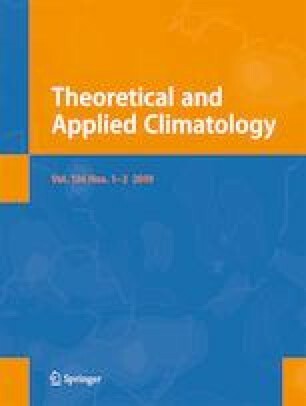 This study investigates structural variations in the low-level jets (LLJs) over the Southern Great Plains (SGP) in the USA during the warm season (WS) and their association with precipitation extremes, with a subset of the strongly contrasting hydrologic years (HY) of 2006 (HY06; drought) and 2007 (HY07; flood). The U. S. National Centers for Environmental Prediction’s Northern American Regional Reanalysis (NARR) and stage IV precipitation data products are used. The large-scale synoptic pattern varied substantially between the two WSs, with differences in the position, strength, and orientation of the Bermuda high to the east and thermal low to the west. The composite structure and variations of LLJs, their environmental conditions, and associated precipitation are diagnosed. Significant differences were noted in the strength, orientation, and dimensions of the LLJs between the two WSs. Environmental features related to the LLJ are characterized by notable differences in timing and distribution of the vertical velocity, temperature, moisture, and instability. The implications of these differences for the timing, distribution, and intensity of precipitation between the two WSs are discussed. Results from this study conclude that the LLJ may not have been a major factor in driving the hydrologic extremes, but it did modify the extremes. In WS 2007, the LLJ enhanced the hydrologic cycle to produce more precipitation over a broader area. In WS 2006, the LLJ was likely a source of dry air advection into the region. Meanwhile, the LLJ was also a source of convergence and rising motion, which lead to a precipitation maximum in its exit region. This study is supported by NASA Water and Energy Cycle Study (NEWS) Program through Award NNX15AD14G.